I don’t bake a lot. Baking is much more precise than cooking and therefore I feel like I’m a little too controlled. With that said, I’ve learned a some things to help make the process a bit less exact while keeping an eye toward better health. You can swap out puréed fruit for some (never all) of the fat in a recipe. Too little fat/too much fruit can make for a rubbery texture. If you can’t subtitute away the fat, try switching up which one you’re using. Add olive or vegetable oil for part of the butter, for example. You can use part whole-wheat flour instead of all just white flour. This adds fiber and some good B vitamins. In most cases, partial substitution is the key to keep from negatively impacting the texture of baked goods. Now, I’ve tried “healthy” brownie recipes that call for using avocado or black beans instead of fat. I’m all for trying new things at least once, but I won’t be doing either again. The avocado brownies tasted like meat (according to my husband) and the black bean ones were a texture similar to that of a shoe. Grease an 8″ x 8″ baking dish. Blend butter and sugar, then add mashed blueberries & vanilla. Separately, whisk flour & cocoa together then add to wet ingredients and mix just until everything is combined–mixing too much will make the texture tough. Add whole blueberries, chocolate chips and cooled toasted nuts. Mix just to combine. Spread into prepared baking dish and bake for 20-25 mins–or 30 if you prefer a less gooey texture. My substitutions involved using pureed blueberries for 1/2 the fat, cutting out 1/3 of the sugar, using white whole wheat flour instead of all-purpose flour and adding lots of walnuts. 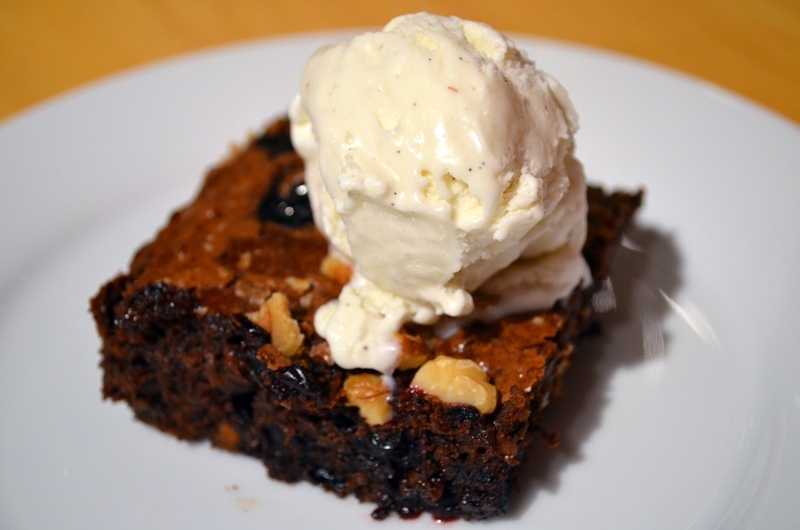 Overall, this doesn’t make the brownies healthy, it just makes them less bad for you–and the tang of the blueberries contrasts nicely with the sweetness of the brownie. So good! Oh, and I’d recommend serving with ice cream or milk to cut the richness. What substitutions do you use to make things healthier, tastier, etc.? Blueberries and chocolate sounds like a perfect combo. Beautiful photo, too! Thanks! I’m really enjoying what I’ve seen of your blog as well. Mmm, I used 1/4 cup tapioca flour and 1/4 cup brown rice flour instead of the whole wheat flour for a gluten free version. I used a little bit (2 Tbsp) more butter and cooked half in lined mini muffin tins. I also swapped out the walnuts for pepitas. They still ended up baking for 20 minutes and came out nice and fudgy. I made them for a birthday party and I’m pretty sure they will disappear. I’ll let you know. That’s great, Laura! I love that you are adapting it to your own needs. That’s one thing I love about cooking–endless possibilities.